David Grier is one of the most award-winning guitarists in recent memory. For the past several years, he has been voted by the members of the International Bluegrass Music Association as Best Guitar Player of the Year. He has also appeared on two Grammy-winning recordings: True Life Blues - A Tribute to Bill Monroe and The Great Dobro Sessions. David is also included in the book 1,000 Great Guitarists. His inspiration to learn the guitar came from exposure to Bill Monroe while his father, Lamar Grier, played banjo for the Blue Grass Boys in the middle 1960s. 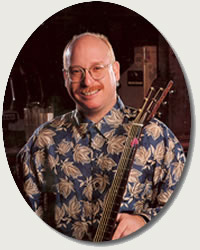 David's first solo recording (from 1988), Freewheeling, appeared on Rounder, as did his highly acclaimed 1991 duet project Climbing the Walls with mandolinist Mike Compton. David's Lone Soldier project is listed in Acoustic Guitar magazine's "100 Essential Acoustic Guitar Recordings of All Time." His most recent Rounder release is Panorama. His work is also captured on an instructional DVD (Homespun). In addition to touring as a soloist, he also appears as the guitarist for Psychograss. In this lesson, bluegrass guitarist David Grier takes all the elements of his dazzling style - slides, hammer-ons, pull-offs, crosspicking, alternate picking, pick-and-finger right hand combinations, bends, double-stops, raking, and other devices and pulls them all together into outstanding solo guitar pieces! Arrangements include: "Liberty, Bill Cheatham, Nine Pound Hammer, Engagement Waltz, and The Meeting". This play-along book/CD contains backups, lead parts and note-for-note transcriptions for 21 essential bluegrass tunes. Songs include: "Black Mountain Rag, Bill Cheatham, Blackberry Blossom, Farewell Blues, I'll Fly Away, Footprints in the Snow, All the Good Times Are Past and Gone, In the Pines, I Am a Pilgrim, John Hardy, Little Maggie, New River Train, Old Joe Clark, Pretty Polly, Don't That Road Look Rough and Rocky, Sally Ann, Sittin' on Top of the World, Soldier's Joy, Roll in My Sweet Baby's Arms, Way Downtown, Down in the Willow Garden". David Grier Plays "Bill Cheatum"